Dec. 23, 2009 Shhhhhh…I’m snagging one of the new “Smencils” that just arrived today ’cause I figure ‘less is more’ and ‘variety is the spice’ when it comes to stocking stuffers…She doesn’t need a whole ‘set’ right? A whiff here and there and she’ll get the gist of the theme…100% recycled newspapers turned into a rainbow of scents and colors. 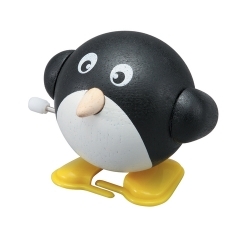 I like finding inexpensive toys that appeal to big kids too (ahem, obviously) so I’m secretly coveting this little $5 waddling penguin as a desk toy because it makes the ‘She Geek’ in me smile, reminding me of the Linux logo! So just by gifting it hopefully you’re tickling the imagination of what ‘can be done’ on a shoestring budget while imparting your own values of ‘choices’ when it comes to what companies get your hard-earned green. Being from Hawaii, I used to read Tammy Yee’s “Baby Honu” often when she was just a ‘keiki’ so I guess I’ve been big on imparting ‘eco-themes’ and endangered animal/ocean messages for a looooong time…This one just squeaks into our ‘ten under $10’ list but the poignant storyline and vivid illustrations make it worth every dime. PLUS, we have an ongoing ‘turtle theme’ in our house, and collect sea turtle tales and endangered leatherback stories to impart media messages wherever we can. (e.g. The Great Turtle Race cartoon digital migration is a perfect use of edu-tech to engage kids with fun media messaging…note to Disney, your talking ‘Crush’ dude could take lessons here!) 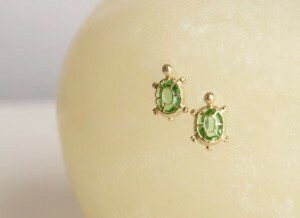 Her dear ol’ dad travels hither and yon so she’s got quite an exotic lineup of turtles (honu) from destinations all over the globe from Istanbul and Saudi Arabia to the Grenadines…wood, glass, figurines, earrings, you name it. When I saw these sustainable earrings of recycled gold (at left) I was tempted (for my teen, I’m pierce-free, believe it or not) but the earrings are $30 so out of my stocking stuffer budget. Clearly I’m a cheapskate placing my ceiling at “ten under $10” but I think anti-consumption is a huge part of the eco-message too, and besides, as a nonprofit, I’m not exactly, er…’rolling in green’ so pennies count. Next pick? Did I mention geckos are right up there with turtles in my critter adoration?–(again, it’s an island thing) Granted, geckos are not endangered, but they were when my dad’s flip-flop was around. I used to ‘rescue’ them from all kinds of circumstances as a child…even my pet dachschund, Agnes. (I set up a tissue box ‘hospital,’ a bandaid box ‘ambulance’ and the works…hmn, whatever happened to that ‘free play’ imagination, eh?) Anyone who’s spent any time in Hawaii knows they become beloved quite quickly…besides, they eat pesky bugs. Anyway, I love that lil’ gecko, and used to read it to my lil’ wahine as a nightly ritual which I could recite equally well with Margaret Wise Brown’s classic Goodnight Moon. 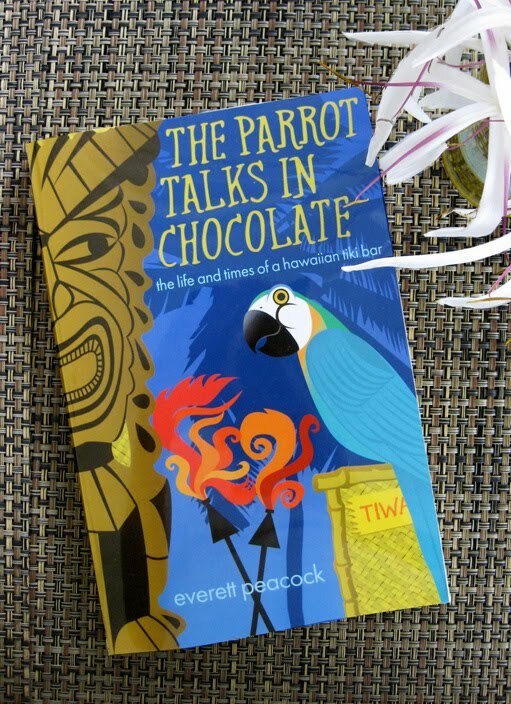 Truth be told, I enjoyed it even more since the gorgeous island artwork conjured visions of plumeria, tradewinds, clear island nites and simpler times. Speaking of which, today I received my stack of tropical treasures ($9 code here through year’s end!) that I bought from my ol’ kamaaina high school pal Everett Peacock. —Pretty impressive considering this mythical creature has almost 300 fans already and I haven’t even gotten around to posting a page for Shaping Youth yet. Sheesh, I’ve been bested by a bird. I’ll bet Joseph Cornell (Sharing Nature with Children) and even Richard Louv of ‘Last Child in the Woods’ (my post about Media Savvy Kids & Nature Deficit Disorder and kids green gardening here) would love to hangout with Tiwaka and impart tidbits of wisdom on this ol’ blue marble. I absolutely LOVE the way these ventures are all using media/marketing in refreshingly positive ways, especially in this increasingly complex world of digitized offerings. I guess that’s my cue to wrap it up for an obvious segue to ‘ten under $10’ in the digital sphere of apps, games and virtual world subscriptions that ‘reach and teach’ using media…Example? Looks like they’re now using a social entrepreneur model to ‘adopt a virtual endangered pet in game’ and bring it to life to pay it forward in the real world too…“Be a force for good” and “Be a force of nature” are two synergistic taglines to be sure! Meanwhile, Mele Kalikimaka! (Merry Christmas!) 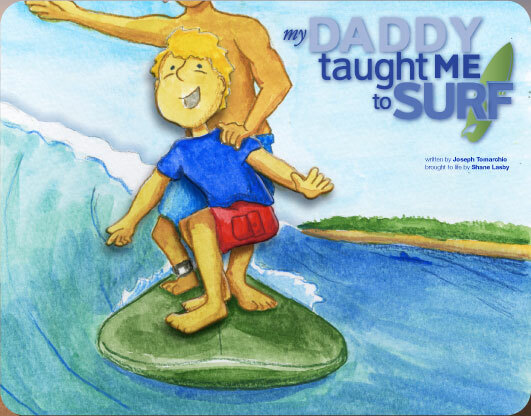 And Mahalo (thank you) for caring about kids–The ohana (family) I feel in this digital community of ours is profound. Thanks for being here…Back soon. These are some excellent suggestions and a great way to get the kids involved in the green movement at an early age. I think more focus should be placed on smaller everyday green items such as the ones you suggested. Surely beats those lead tainted China toys.